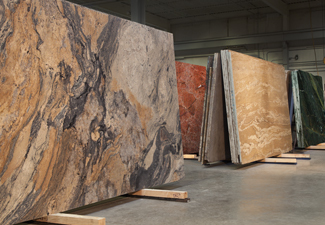 With our ever changing inventory, Mont offers you natural stone, Mont Engineered Surface, and porcelain slabs that can’t be found anywhere else. We travel the world over to ensure that your material selection will be unique, personal and timeless for your specific project. 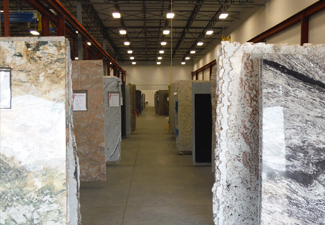 Enter the Mont Indoor Slab Showroom and take in the view of hundreds of full-size slab varieties. Take a moment and consider your lifestyle and determine whether you would prefer neutral or bright and bold color tones. Knowing your preference will help make your decision process easier. Our trained and supportive sales team recognizes that you have entrusted Mont to assist you. We are here to help you through the process in every way possible. 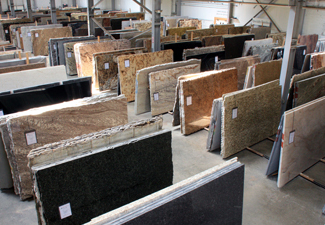 Many visitors come back to our facility several times before making their final selection. Slabs are placed on hold for a maximum of 14 days. Your industry trade professional is notified of your selections. Upon receiving a purchase order from your industry trade contact, Mont will deliver your selected materials for fabrication to your chosen contractor. If for some reason the 14-day time period is close to expiration, your trade professional will be contacted prior to the slabs being removed from hold and returned to our inventory for sale to other visitors. When you have confirmed your material selection, we highly recommend you follow up with your industry professional to order and take delivery of the selected materials before the 14-day time period elapses. This ensures that you will receive the slabs you have hand-selected. All materials are listed under price categories (A to Z and 1-5) which are for your industry professional’s reference. A-Z and 1-5 Categories: Systems used by Mont to offer customers pricing guidelines. 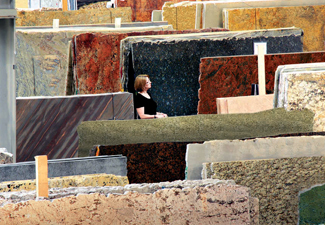 Your industry professional will offer pricing to you on each of your material selections. This is based upon your specific project. 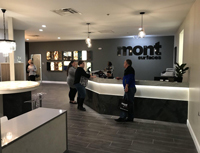 Mont does not address pricing of materials. We are strictly a raw material supplier. Questions about fabrication, installation and layout of your project should be addressed directly with your industry trade professional. We welcome any questions that you may have pertaining to our products. Click here to contact us.